As football players worldwide return to their clubs to prepare for the upcoming season, Nike releases the new Lightning Storm Pack. 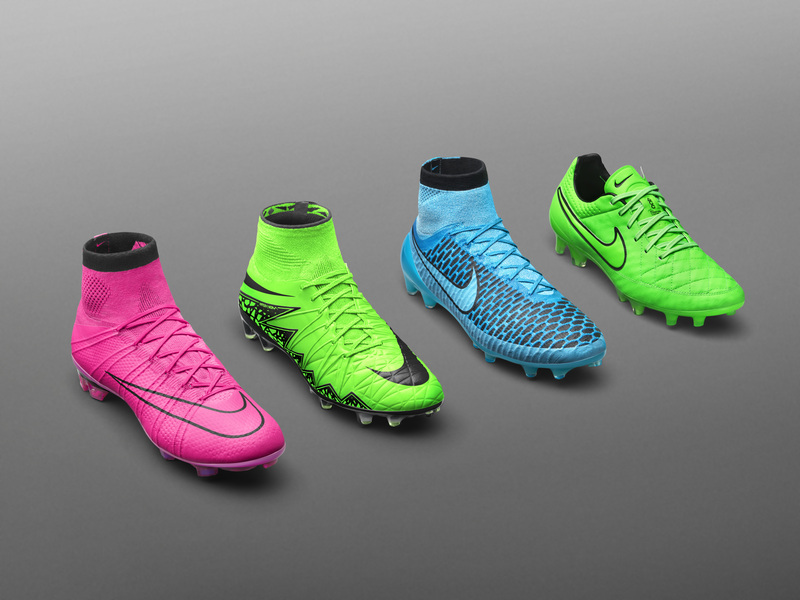 The bold boot collection, which will be seen on professionals starting July 23, features the new Hypervenom II, the Mercurial Superfly and Vapor, the Magista Obra and Opus, and the Tiempo V in an assortment of bright colors. The new collection will be worn by Premier League stars Wayne Rooney, Eden Hazard, Raheem Sterling and Daniel Sturridge as the 2015-16 Premier League season kicks off. The Nike Lightning Storm Pack Mercurial debuts an all Hyper Pink upper with a black outline Swoosh. The Nike Lightning Storm Pack Hypervenom II, which will be worn by Neymar Jr., features a Green Strike upper with a Black outline Swoosh. The Nike Lightning Storm Pack Hypervenom II features a Total Orange Upper and Black outline Total Orange Swoosh. The Nike Lightning Storm Pack Magista introduces a Turquoise Blue upper and Black outlined swoosh and upper detailing. The Nike Lightning Storm Pack Tiempo V features a Green Strike upper and a Green Strike and Black outlined Swoosh. The collection will be available July 17 exclusively in the Nike Football App and July 19 on Nike.com. The green Hypervenom II will be available July 21 in the Nike Football App and July 23 on Nike.com.